Both of these companies are focused on diabetes, but which is the better choice for investors today? America spends more than $322 billion each year treating the 29 million patients who have diabetes or prediabetes. That's a staggering number, so it's not hard to understand why several companies have chosen to specialize in treating this disease. MannKind (NASDAQ:56400P706) and Dexcom (NASDAQ:DXCM) are two such businesses. Both companies have launched innovative products that are designed to make it far easier for patients to manage their disease. But which company is the better bet for new money today? Let's take a closer look at both of them to see if we can ascertain an answer. Many people with diabetes are forced to inject themselves with insulin multiple times each day in order to keep their blood sugar levels in an acceptable range. While this has been the standard of care treatment for generations, many patients do not like to give themselves injections. MannKind's big idea was to make insulin inhalable, thereby providing patients with a needle-free way to meet their fast-acting insulin needs. After years of research, the FDA finally gave the green light to the company's product -- called Afrezza -- in 2014. Unfortunately, MannKind has faced numerous obstacles in commercializing the drug. Sanofi -- Mannkind's former partner -- priced Afrezza at a big premium to other insulins, which caused many insurers to place restrictions on its use. That made it quite difficult for patients to access the drug. The situation got so bad that Sanofi threw in the towel less than a year into the launch. Predictably, that caused MannKind's stock to tank. The terrible launch and loss of a deep-pocketed partner put MannKind in a tough position. Over the last year, the company has been scrambling to cut costs, raise capital, and relaunch the product. Thankfully, MannKind has made a number of moves that have greatly enhanced its financial position. The company recently received a $30 million cash injection from Sanofi. It also sold one of its buildings for $16 million. When adding in other ways to access capital, MannKind has given itself a little bit of breathing room. The company also executed a reverse stock split earlier this month that should alleviate the threat of being delisted from the Nasdaq for having a share price under $1.00. Of course, the only thing that matters from here is how fast MannKind can ramp sales of Afrezza. Third-quarter sales of the drug were only $573,000, which is a still just a pittance. Only time will tell if MannKind will be successful with its attempts to relaunch the product. Unlike MannKind, Dexcom has been a market darling for years. This company's success can be traced to the rapid uptake by the diabetes community of its innovative continuous glucose monitoring (CGM) system. This disposable device is worn on the body for up to seven days and constantly uploads a patient's blood sugar levels to a receiver or phone. This provides patients with a convenient way for them to track their glucose levels in real time, enabling them to better manage their disease. What's wonderful about this business is that Dexcom operates a razor-and-blades business model. Each consumer that signs up gets locked into buying the company's high-margin consumables for years. With more patients signing up every day, Dexcom's revenue growth has been extraordinary. In turn, the stock price has soared. Thankfully, even today Dexcom believes that it has still only scratched the surface of what's possible. While roughly 200,000 patients are active Dexcom users, that's still just a tiny fraction of the 29 million Americans that have diabetes. The opportunity looks even bigger when you zoom out to include the rest of the world. On the downside, Wall Street has caught on to Dexcom's growth potential and has priced its shares accordingly. The company is currently trading at 13 times sales, which is an unbelievably expensive premium. With medical device giant Medtronic gearing up to launch the first artificial pancreas, it is possible that Dexcom's growth rate could start to slow. If true, then traders might find Dexcom's nose-bleed valuation to be too rich, and shares could take a tumble. While some investors might find MannKind's tiny share price to be attractive, I for one think its stock is too risky to touch. 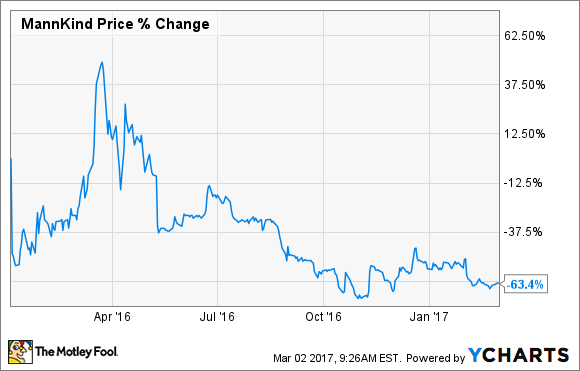 That's why I'd vastly prefer to buy Dexcom instead, even though the company's stretched valuation makes it a risky stock, too. 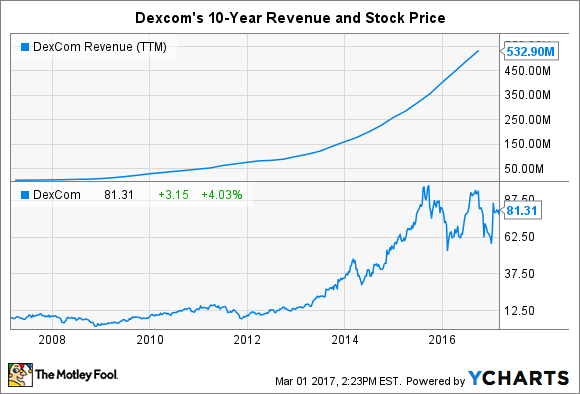 Still, Dexcom is rapidly expanding, nearing profitability, and has a debt-free balance sheet. That makes it the better buy in my book.